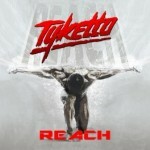 Share the post "Album review: TYKETTO – Reach"
Four years ago, the much-anticipated release from Tyketto’s original line up, ‘Dig In Deep’ fell rather flat – it was not a bad album in its own right, but failed to live up to the impossible expectations of those expecting a repeat of classic debut ‘Don’t Come Easy’. Now founder members Danny Vaughn and Michael Clayton Arbeeny are spearheading something of a fresh start. The revised line-up, with a trio of Brits, have sought to capitalise on some excellent live shows in the intervening years by recording a new album. ‘Reach’ opens in spectacular fashion with the title track opening with almost Queen-like layered instrumentation, a guitar solo from Chris Green up front, and a typical Danny Vaughn vocal melody. It is destined to be a classic, but sets an impossibly high bar for the rest of the album. The riffage of ‘Big Money’, marginally let down by a weaker chorus, and ‘Kick Like a Mule’ both show how Chris’s more aggressive guitar style – with some arpeggios reminiscent of Mr Big’s Paul Gilbert – gives the album a tougher, sharper feel than ‘Dig In Deep’. Nevertheless there are mellower moments reflecting Danny’s love of rootsier forms of rock with the atmospheric ‘Circle The Wagons’ complete with mid-song organ solo from Ged Rylands, and the reflective, almost country-ish ‘Letting Go’. The more straight ahead rockers of ‘I Need It Now’ , ‘Tearing Down The Sky’ and ‘Fastest Man Alive’ have a natural, unforced feel to them, with at times a bluesy tinge not unlike Danny’s underrated post-Tyketto 1990’s project Flesh And Blood. ‘Remember My Name’ has great melodies on the chorus and though there is a slight dip in quality near the end, ‘The Run’ is an interesting closer, a biker anthem that starts in laid back fashion but gathers tempo with great guitar solos that show off Chris’ immaculate technique. This entry was posted in ALBUM REVIEWS, ALBUM REVIEWS (Mobile), All Posts and tagged album, Chris Green, Danny Vaughn, Ged Rylands, melodic rock, Michael Clayton Arbeeny, review, Tyketto. Bookmark the permalink.